In the spring of 2012, Spain's 4th largest bank Bankia requested a bailout of €19 billion and it became clear that the whole of Spanish banking system will need government support. The world's markets had suddenly shifted their attention from Italy to Spain as the next hot spot in the Eurozone crisis. Spain-Italy 10yr government bond spread spiked, quickly turning positive. In recent days however the spread became negative again. Italy is now viewed as being riskier than Spain. This trend seems a bit surprising since the fiscal situation of Spain is thought to be worse than that of Italy. While Italy's current debt levels are higher in absolute terms as well as a percentage of the GDP, Spain's government deficit is far worse. At this stage however Italy's poor economic recovery and political mess make Spain a better risk - on a relative basis of course. Both nations are struggling with an extraordinarily long economic contraction that started in 2011. But it recently became clear that Italy's recovery is materially slower of the two. And last week Italy surprised the markets with a sharp downturn in industrial production that contributed to the poor result for the euro area as a whole (see Twitter chart). But how does one reconcile all this with the fact that Spain runs just over 26% unemployment rate, while Italy's rate is around 12%? This takes us back to the question of how Spain got its ridiculously high unemployment to begin with. It has to do with the nation's high temporary workforce which provides corporations with better labor flexibility (see post). And this ability to lay off workers and lower prices during a slowdown and quickly rehire them when the situation improves makes Spanish firms more competitive on average. This competitive advantage is in part why Spain's export growth has outpaced that of Italy. It also doesn't help Italy's case when political uncertainty raises the risk of another debt crisis flaring up. And as always, Italy's most powerful crook, Berlusconi (see post), is at the center of it all. Reuters: - European Union officials warned Italy on Sunday not to let politics ruin recovery prospects and upset debt markets in a week that could signal the end of Erico Letta's fragile five-month-old government. "I believe it is of paramount importance to keep political stability in the country to ensure a recovery, mainly because the latest data show the economy remains relativity weak, without clearly indicating a return to growth," Rehn, the EU's top economic official, told Italian business daily Il Sole 24 Ore.
Italian industrial output was much weaker than expected in July, falling 1.1 percent and undermining expectations that the country might emerge from its longest post-war recession in the third quarter. Political instability has thwarted attempts to make the economy more competitive and whittle down Italy's government debt burden, one of the world's biggest. Berlusconi's centre-right allies have threatened to sink the government if Wednesday's vote goes against him. While both nations are far from economic stability, political uncertainty and weak recovery make Italy's situation look worse than Spain's. 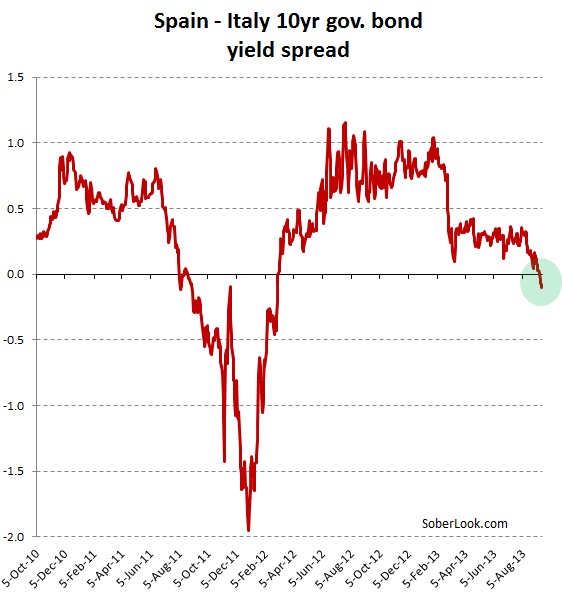 Sensing this dynamic, markets took the Spain-Italy spread into negative territory.